LOCAL FOOTBALL: Will the underdogs have bite in the PFA Cup semi-finals? Action from Whittlesey Athletic at Peterborough Sports Reserves. Photo: David Lowndes. ICA Sports are hoping the ‘year of the underdog’ continues in the PFA Senior Cup tomorrow (March 26). Only holders Whittlesey Athletic of the top-flight big guns have survived to the last four stage and they will be warm favourites to beat ICA in their semi-final at Feldale Field (2pm). Action from Peterborough Sports Reserves (white) v Whittlesey Athletic. Photo: David Lowndes. 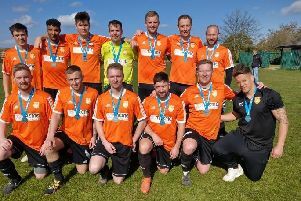 The other semi-final is between surprise packages Langtoft United (ninth in the Premier Division) and Division One leaders Stamford Lions, which takes place at the former’s Manor Way ground. The prize for all four is huge with the final taking place at Peterborough United’s ABAX Stadium in May. ICA boss Hamish Curtis said: “We’re looking forward to the game. “We’re a young, growing team who are up against a srong, seasoned outfit with big-game players full of experience. Action from Peterborough Sports Reserves v Whittlesey Athletic (blue) at PSL. Photo: David Lowndes. ICA warmed up for the big game with a 2-0 Premier Division win at bottom club Riverside last weekend (March 19). Top scorer Andy Wayte, who is sure to be a key man at Whittlesey, and Joshua Smith scored the goals. Whittlesey recorded an impressive 2-0 win at Peterborough Sports Reserves with feared local marksmen Liam Harrold and Matt Heron the men on target. That result moved Whittlesey above Sports into second, but they are a massive 11 points behind runaway leaders Moulton Harrox who followed a 4-0 home win over Sawtry with a 2-1 midweek success at Peterborough Sports. Langtoft and Stamford Lions are seeking their first appearance in the PFA Final and both will fancy their chances. Lions are in the better form, albeit at a lower level. They’re on a seven-game winning streak in Division One and have opened up a five-point lead at the top. They won 5-2 at third-placed Oundle last weekend. Langtoft have lost four of their five top-flight fixtures since reaching the prestigious semi-final.